Money is an excellent gift to commemorate a young graduate’s accomplishments and help them enter an exciting new chapter in their lives. Rather than handing over an ordinary envelope full of cash, celebrate this joyous occasion by turning your donation into a memorable and personalized gift. 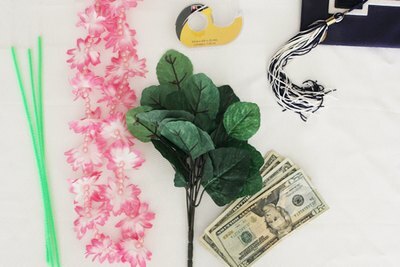 The new grad can proudly wear the money lei on graduation day and keep it as a sentimental memento to cherish long after the money is gone. Fold your bill in half lengthwise and then fold it into quarters as shown. 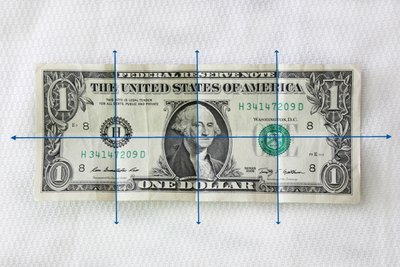 Make sharp creases so you can clearly see the fold lines on the bill. 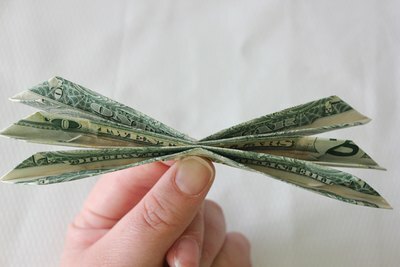 Then, unfold the bill. Fold each corner in toward the first quarter crease line. Fold the top and bottom edges in lengthwise toward the center crease line. 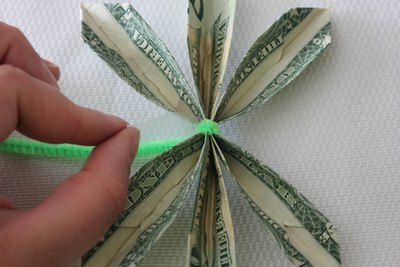 Fold the bill in half lengthwise along the original center crease. Repeat the first four steps on two more bills of any denomination. 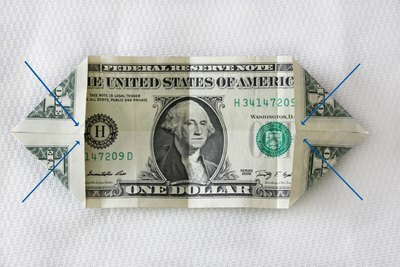 Stack three folded bills on top of each other and pinch them together in the center. Loosely twist your pipe cleaner around the center. 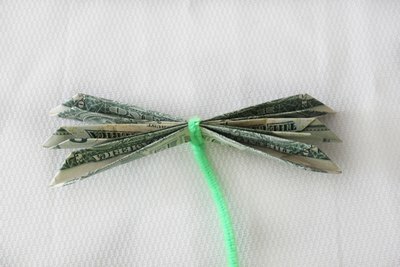 Leave a little room between the pipe cleaner and the folded bills so you can insert leaves later. Fan out the petals of your money flower. Place a 1/2-inch piece of double-sided tape in between each of the petals to help the flower maintain its fanned-out shape. 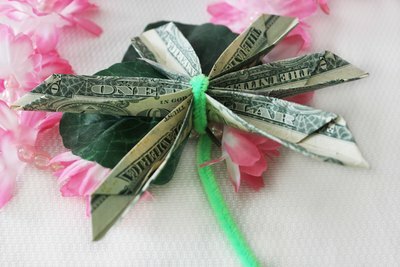 Tip: The double-sided tape will peel off easily from the money, but make sure to tell the recipient the tape is there so they can use caution when disassembling the money flower. 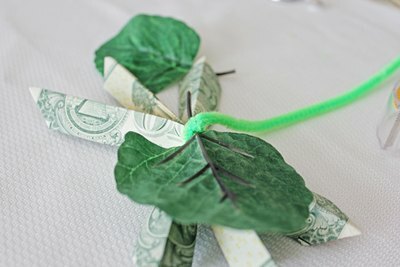 Turn your flower over and slide the stems of your silk leaves underneath the pipe cleaner. After you have added the desired number of leaves, twist the pipe cleaner tightly closed to ensure the leaves and flower stay in place. 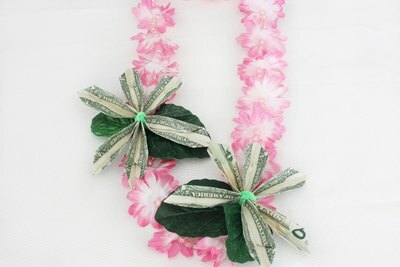 Use the remaining length of pipe cleaner to fasten your money flower onto your lei. Twist the pipe cleaner tightly around the lei and trim any excess. Add as many money flowers as you would like to your lei. How Much Money to Give As a High School Graduation Gift?